Here is how to troubleshoot a fluorescent light fixture that will not turn on or flickers. Many times when a fluorescent light starts to flicker or takes a long time to turn on the ballast or light starter is going bad. If just one of the fluorescent tubes does not light (with a fixture with 2 or 4 bulbs), obviously it could be a burned out bulb. Before doing anything that involves replacing parts, try the DIY steps below to fix it yourself. First start by making sure you have power being supplied to the light fixture. If flipping on the switch does not turn the light on, check the circuit breaker. Once you confirm you have power going to the light, the next thing to do is make sure the fluorescent tubes are not burned out. If you have only one bulb out, it is most likely just that bulb has burned out and replacing it should fix the problem. If all of the tubes DO NOT turn on, then most likely it is a bad ballast. However it is possible for all bulbs to burn out at once but this is not likely. To rule out a bad tube or bulb, you need to determine if you actually have a burned out tube. Remove the metal cover that shields the ballast. Turn on your voltage detector and hold it next to the wires supplying power to the ballast. If power is being supplied to the ballast but not out to the bulbs, it is a bad ballast and needs to be replaced. There are many different types of fluorescent lights. Your light fixture may be slightly different from the description we provide but the principal is the same. First turn off power. We recommend to turn the power off at the breaker to prevent accidental power being supplied to the light while you are working on it. 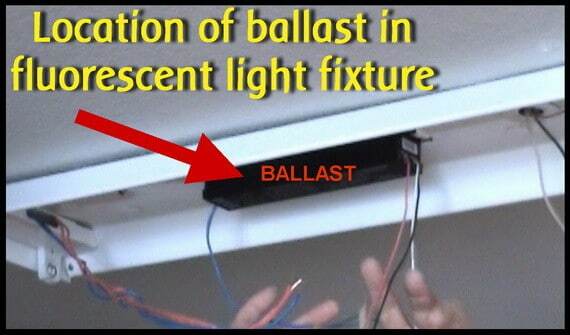 Find out the type of ballast your light fixture has. Purchase the same type of ballast or compatible at your local home improvement store or online. 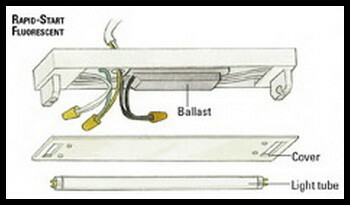 NOTE: Sometimes a ballast is MORE EXPENSIVE than a completely new fluorescent light fixture. Do some research to find out which is cheaper before you purchase anything. Once the old ballast is removed, screw the new ballast into place using the screws provided. Wire it up according to the schematic and instructions provided. If you have to cut wires, it is recommended to use electrical tape on top of the wire nuts for reasons of safety. Once the new ballast is wired up, replace the ballast cover. Install the fluorescent tubes back into the fixture. Turn the light back on and test to be sure the light works. If you know of an easier way or method to troubleshoot or repair a fluorescent light fixture, please let us know by leaving a comment below. Thanks! Electrician suggested I replace three fluorescent light fixtures by simply unscrewing them from ceiling, screw in new ones, and voila. So I get back from HD with three new units. I open the first one and now have it assembled, but there is no electrical plug for it, and no extra wiring to connect it to if I had one. At one end of my four-footer, two-lite fixture I have red and white wires connected to one bulb point, and a single white wire connected to the 2nd, same end. I have a blue and white wire connected to one bulb point, and a single white wire connected to the 2nd. The single black wire I have grounded to the green screw in center of fixture. I have it on table next to old fixture I took down, which has an electrical cord and plug coming out the one end, and spliced into a plastic doohickey which also has a white wire connected to it. Had I known it was going to be this hard…. I thought fixtures would at least come with electrical wiring and plug. I have it assembled correctly, w/o an electrical cord for power. I have T5hd high bay lights with six lights in them the tombstones were broken by a coworker when changing the bad lights out. There isn’t any videos out there to help me see how to change and wire the new ballasts and tombstones into the t5 high bay lights. I do know how to change t8 and t12 lights tombstones and ballasts, but the wiring is very different in the t5 high bay lighting. Any help is appreciated. Is the old ballast and tombstones removed? Is it not possible to cut one wire at a time from the old ballast to make sure you have the wiring correct to the new ballast? Turn the fluorescent lights off, cut one wire off at a time on the old ballast and connect that color coded wire to the new ballast, do this until all the wires are connected to the new ballast. 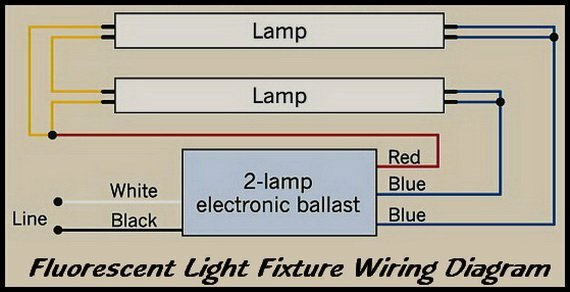 If the ballast is not in the light fixture and you cannot figure out the wiring, check all over the light to see if there is a wiring diagram. There should be a small picture somewhere on the light fixture to tell you how to wire it. Please let us know if you need additional assistance.